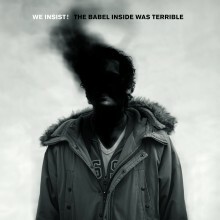 The Babel Inside Was Terrible (2009) - We Insist! We Insist! After recording 2007's “OH! Things Are So Corruptible” at Black Box Studio with Peter Deimel (Chokebore, The Kills, etc. ), this incredibly talented producer once again worked vigourously with We Insist!, recording and mixing the album in just 3 weeks. The final result of this shared labour brings us a tense album slightly on-edge, encompassing more grief and darkness than ever before. All this is blended on a sheerly overwhelming level of musical craftsmanship which leaves you breathless (electric saxophone, experimental effects, keyboards). Highlights on the album really jump out at you like "Oakleaves", while others tracks formed the milestones of live performances from 2009-2013, such as "Custom Device" and "Deja-Vu".